TUTORIAL: from Video Recording to Final Processing of my mosaics... - SolarChat! time and work for you. It feels like you are inviting guests into your house and you are an excellent host. There are steps in this tutorial that I know but the real magic for me begins after you start applying Tons forcés/Tons clairs. It is also a great help to actually see the tones in your original Tiffs and the screen shots bring everyone into a familiar environment. I've had some success with your method when I start with Tiffs where the prominences are barely visible but the success was only good luck. I needed to see what your original Tiff looked like. To just say thank you seems inadequate. Last day, I took a few SER files at 16 bits to play with. 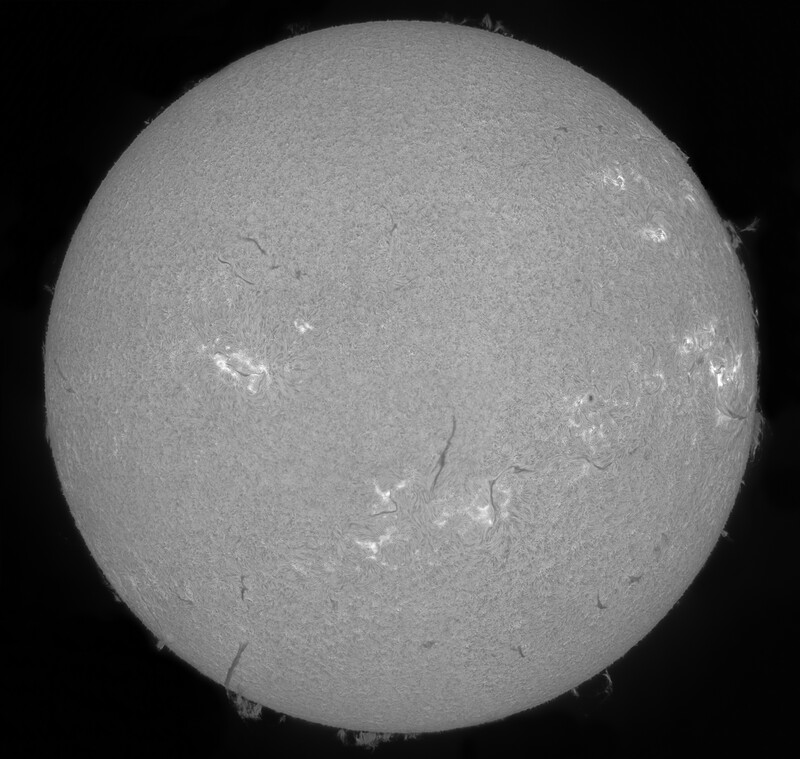 Most were decent shots of the disc but showed no evidence of proms as in the first image below. Applying Shadows/Highlights was a little disappointing. It seemed that when I corrected one problem, another was produced. Without selecting and inverse selecting to process using Levels, I couldn't do much to extract the proms. The parameters given in this post did a lot to save this file. The final brightness will depend on the Tiff brightness you start with but that can be easily altered according to taste. The most impressive feature in this fairly rapidly done processing is the prom detail. There are some artifacts due to over sharpening and parameter settings but those can be suppressed. I'm going to have a busy afternoon reprocessing last day's and today's files with this technique.